« Lemon Challenge for September 15th! October 1st Challenge, The Pumpkin! The origin of this weeks mystery ingredient is……. a mystery! Though this mystery probably has its origins in North America, as pumpkin-esque seeds have been found in ancient Mexico. 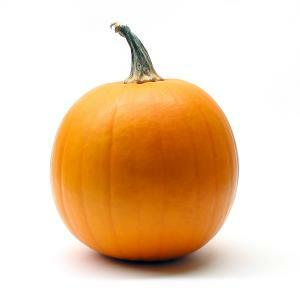 Similar to a squash, a pumpkin is a fruit that is borne of vines which have both male and female flowers. These flowers were at one point pollinated by a specific bee called the squash bee, which we have managed to nearly eliminate thanks to pesticides, leaving the job to our friend, the honeybee. I’ve seen (and heard from pumpkin farmers) that there is a difference between carving pumpkins and eating pumpkins, though websites I’m finding this morning say either can be used. (My guess is that it has to do with the thickness of the walls? anyone have any others?) There are a variety of pumpkin products out there, including canned pumpkin, pumpkin seeds, pumpkin oil, and pumpkin extract (which may help with type 1 diabetes). The majority of canned pumpkins (90%) are from Illinois. Bad rains last year have put a dent in the availability of canned pumpkin, but in this season, most of us should have no problem finding real pumpkins to experiment with this weeks. Good luck!